Medium - €22.99 Only 8 left! Standard - €23.99 X-Large - €22.99 Only 2 left! Do you hear that ringing, or is it just in our imaginations? Oh wait, it's actually the phone ringing. It's the 60's calling for you, man, so are you gonna answer? 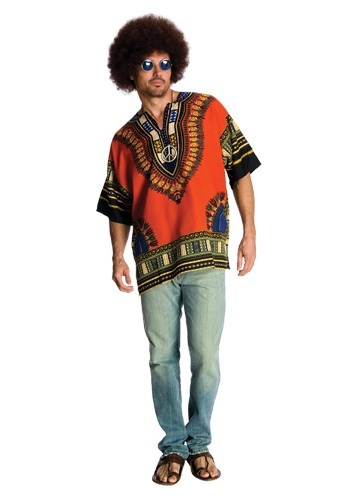 If you do decide to take a trip back to the 60's, you should bring this Hippie Dude Costume with you, just in case you, you know... need it, man. As it turns out, you can revisit the 1960's without using mind-expanding chemicals. Thanks to the wonders of modern costume technology, it's possible to experience the peace, understanding, and wild tunes that were so big during Woodstock and the Summer of Love. What makes using a costume to experience this era so great is that you can still have all the fun of travelling freely around the country in a VW Bus with your friends. But, if you get stranded in the middle of nowhere, you can just use your cell phone to call for a lift. Pretty far out, man! So, what do you need to look like a groovy 60's hippie? Well, for starters, you need this brightly colored shirt with wild designs on it, to help you give off a real mellow vibe. The big afro wig and peace sign pendant will show everyone that your mind is as free as your hair, and that you're into peace and love. The most important things to bring with you, though, are these round framed blue sunglasses. They'll let you see the world in a whole new way! You're gonna have a groovy trip back to the 60's, man. Just try not to drink any mysterious Kool-Aid and forget how to get back home.